How to configure OpenVPN-AS with Admin Web UI? You should see the Admin Login prompt (if you do not see that prompt, double-check that you are using the complete URL, including the “/admin”part at the end). At the Login page, enter the username and password for the administrator user, as specified during the ovpn-init step. This username will either be “root” or the username of the new account created when you ran ovpn-init, and similarly for the password. If you purchased a license key you will need to input the key via the license key page. 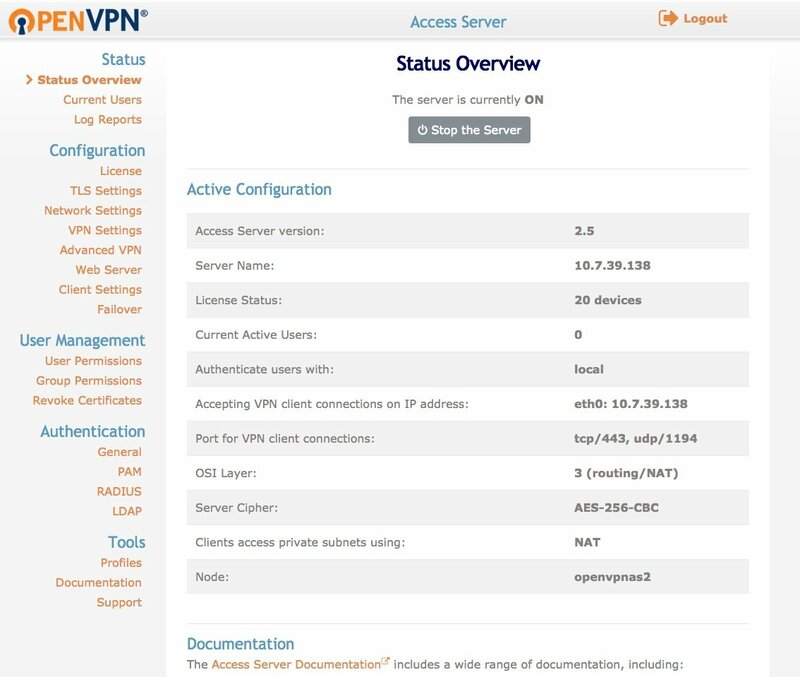 Installing a license key is usually the first step.On the License page there is a link to the OpenVPN Access Server Downloads page. You can grab your purchased key from that page and paste it in the license key box. For more information about activating your license key you can visit this link: How to activate your license key in OpenVPN Access Server. Before attempting to start the VPN Server (with the “Start the Server” button on the Status Overview page, or with the “Start” button in the “At a Glance” section on the right side of the page), you should confirm that the desired settings are chosen on the Server Network Settings and VPN Settings pages.You can also use the Connectivity Test page to verify that VPN Clients on the Internet can communicate with your Access Server for the chosen network settings. Note that initially, Access Server is configured to use PAM for user authentication.So remote users can login to the Client Web Server using the same usernames and passwords they use to authenticate to the server host running the Access Server.You can also choose to authenticate users via RADIUS or LDAP by selecting one of those authentication system types on the Authentication General page in the Admin Web UI; you would then configure the authentication settings on either the RADIUS or LDAP pages. Note that once you have the VPN Server running, changes made in the Admin Web UI (by pressing “Save Settings” on a given page) are stored but not immediately propagated to the running server.Use the “Update Running Server” button to propagate any saved changes to the VPN Server.